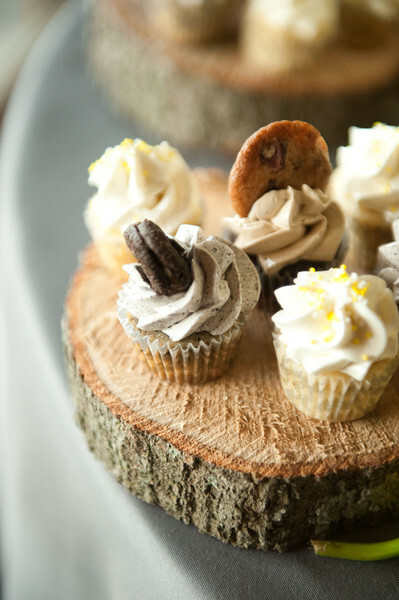 You really can’t go wrong with cupcakes at a wedding reception. Everyone loves cupcakes and they’re a fun way to add a modern twist to a dessert table. But you know what makes cupcakes even better? When they’re topped with yummy frosting AND cookies! Check out today’s featured (cup)cakes! You can see a cupcake topped with a chocolate chip cookie (yes, pls!) and another with a chocolate cookie. It’s like two desserts in one! Your guests will love these sweet treats and you can customize them with your favorite cookie flavors. Imagine cupcakes topped with macarons. Oh so yummy! You can find these cupcake here. They were created by Reese Moore Weddings.